There's a very fine line between paying homage to a director and shamelessly ripping them off. This becomes even finer when said director happens to be closely involved. 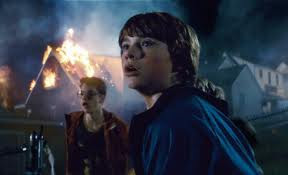 Super 8 has Steven Spielberg embedded in its DNA, and J. J. Abrams has made a conscious effort to express his admiration. But while the result is solidly entertaining, it lacks originality where it's most needed, and settles for just invoking Spielberg rather than explaining his appeal. You don't have to be an expert on Spielberg's back catalogue to spot all the little references to his work. The plot is essentially a reworking of E. T. and Close Encounters: a community is disrupted by the arrival of an extra-terrestrial, whose presence appears threatening at first but who gradually emerges as something more benevolent. The children are all classic Spielberg children, looking for a source of affection to replace or restore that of their parents. Like Spielberg's monster movies, the threat in Super 8 is ultimately a device for bringing the different family members closer together. In Jaws it is the death of the shark, in Jurassic Park the escape from the island, in War of the Worlds the defeat of the aliens - and in Super 8, the strange goings-on which allow the alien to leave. 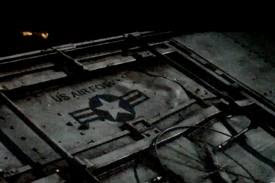 The alien's departure symbolises the lifting of all the grief the main character was carrying; as he lets go of the locket, his burden finally disappears. Super 8 is also a film which has affection for the origins of cinema, and in particular how the likes of Spielberg cut their teeth. Spielberg, George Lucas and many others from the 1970s and 1980s first pursued their interest in film by making shorts on Super 8mm. This was preferential to standard 8mm because of the wider amount of frame space and how simple it was to load and develop. The chaos of shooting a film is very well-evoked, celebrating the boundless enthusiasm of amateurs. More than this, however, Super 8 has affection for the cinema of Spielberg's peak. It harks back to a time when mainstream films, including the first genuine 'blockbusters', were created to appeal to the widest possible audience and have something for all the family. There is nothing about the premise of Super 8 which smacks of demographic profiling or obsession with opening weekends, and in an age where both are present in extremis, that is to be celebrated. But there's only so far that affection and celebration can go before Abrams has to bring something new to the party. And while he succeeds in knitting all the different threads of Spielberg into a decent premise, he is ultimately unable to add his own directorial stamp in many ways other than the improved effects. What you end up with is an early-1980s film with a 21st-century sheen, providing welcome and familiar thrills but not explaining why such a throwback is necessary. The moment which first raises alarm bells about Abrams is the lengthy train crash which occurs while the children are filming. Spielberg fans will recognise this as a nod to The Greatest Show on Earth, which Spielberg credits as the film which convinced him to become a director. But rather than just give us a decent crash and move on, Abrams sees his chance to play with his laptop and create the mother of all train crashes. The result is a crash which looks great in a trailer but goes on far too long and crucially loses sight of the emotions in the presence of all the effects. Throughout his career Abrams has been the master of hype. He knows how to edit a trailer, he knows how to assemble special effects, and he knows how to manage viral marketing campaigns to get fan-boys into a frenzy. What he hasn't yet mastered is integrating the human drama around these effects and sustaining the thrill that comes from the premise. In the end he seems more interested in how big the train crash can be than how we should feel about the people coming out of it. To be fair to Abrams, you could argue that this is indicative of what we have lost in filmmaking, both from Spielberg developing as a director and from the numerous changes in Hollywood since the late-1970s. The advance of CG effects since Jurassic Park, the relentless emphasis on marketing and the convention of opening a film everywhere at once have created a culture of homogenised, overly conservative filmmaking which has to look a certain way in order to sell. That's all very well, but the irony remains that Super 8 has less emotional depth than you might expect from a film with Spielberg as both executive producer and creative force. Because the story and execution is so familiar, scenes are often played with the assumption of emotional involvement rather than actually doing the legwork to create it. 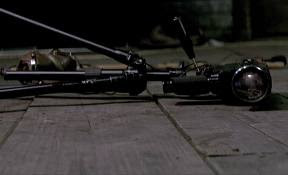 We have become so used to Spielberg's trademarks that we are almost obliged to well up or be engrossed when they turn up on screen - something which works in Super 8's favour but which ultimately feels dishonest. The central problem with Super 8 is this. If Spielberg were directing, giving us all the familiar awkward emotional moments, this would be regarded as an enjoyable but unremarkable example of the genuine article. Instead it feels like Spielberg is using Abrams as a proxy, getting him to make the kind of films which, if Terry Gilliam is to be believed, he has forgotten how to make himself. Given the choice between the real thing and a self-conscious, foul-mouthed imitation, I know which one I'd take. If we put these concerns to the back of our minds, Super 8 does pass the time very nicely as a piece of popcorn entertainment. The material may be familiar but Abrams plays it with a straight face, resisting the urge to slip into knowing pastiche. 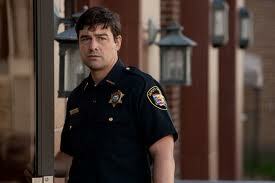 The various plot strands involving broken families, arguments between father and son and small town chaos are handled competently, and the effects in and of themselves are pretty spectacular, as you might expect from the man who produced Cloverfield. One aspect of Super 8 which does work well is the monsters. Joel Courtney's character does the zombie make-up and props for the short film, and speaks lovingly about building stuff to blow up or freak people out. This is where the affection for Spielberg's craft comes through, since his monsters have always had a tactility and personality. The alien when we finally see it may be CGI rather than something physical, but it still feels like it has had emotion poured into its creation. The other coup of Super 8 is being a big, romping blockbuster without many recognisable names in the cast list. Out of the leading child players only Elle Fanning has any kind of prior career, and both she and those surrounding her acquit themselves very well. Joel Courtney is very convincing as Joe, and we believe in his relationship with Alice (Fanning) as much as his quarrelling with the director Charles (Riley Griffiths). Most of the adult performers are confined to playing ciphers or conforming to clichés, but Kyle Chandler in particular makes the best of what he has. Super 8 is an enjoyable but far from brilliant film which will satisfy blockbuster audiences without offering them much that is new. The child cast is very convincing, and those in a nostalgic mood will find a lot to enjoy in the various nods to Spielberg. But while its familiarity is comforting, it is also the thing which works against the film, settling for convention and assumption instead of moving things on a little further. As a two-hour diversion it does its job, but one is left with the feeling that this could have been a lot more super.